The English architect A.W.N. Pugin designed only a small amount of jewellery. This brooch is part of a larger set (parure) of jewels in the Gothic style and the design is inspired by medieval ecclesiastical decoration. Pugin designed it for the lady he proposed to make his third wife. The marriage did not take place, and in 1848 he met and married Jane Knill and gave her the parure. In 1851 the complete parure appeared at the Great Exhibition in London as part of the Medieval Court. 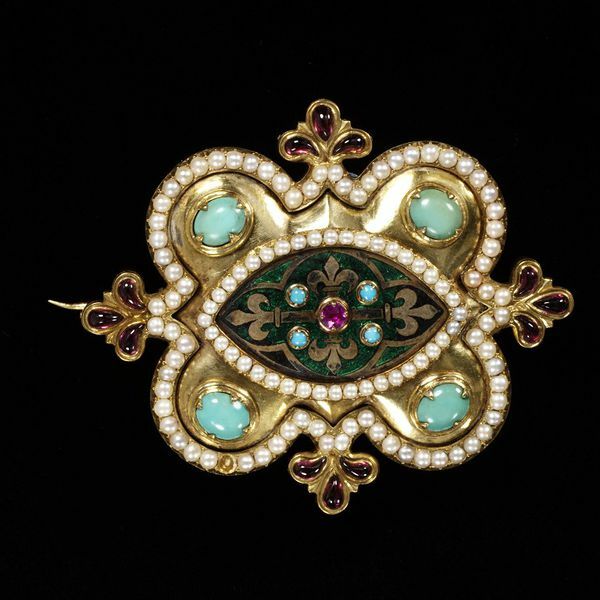 Enamelled gold brooch, set with a ruby, cabochon garnets, turquoises and pearls. Designed by A.W.N. Pugin as part of the parure of which M.10-1962 is a part.